Frederica Wilson was born on November 5, 1942 in Miami, Florida. She earned a bachelor’s degree in elementary education from Fisk University in 1963, and a master’s degree in that same field from the University of Miami in 1972. Over the course of her professional life, Wilson worked variously as a teacher and assistant educational coordinator at Head Start Miami, an administrator at Skyway Elementary School in Miami Gardens, and executive director of the Office of Alternative Education & Dropout Prevention at Miami-Dade County Schools. She was also a member of the Miami-Dade County School Board from 1992-98. Wilson launched her political career in 1998, when she began a four-year stint in the Florida State House of Representatives. She then served in the Florida State Senate from 2003-11. And since 2011 she has held a seat in the U.S. House of Representatives, representing Florida’s 17th Congressional District from 2011-13, and the 24th Congressional District thereafter. She is a Democratic member of both the Congressional Black Caucus and the Congressional Progressive Caucus. Describing herself as a “Voice for the Voiceless,” Wilson believes that: women should be entitled to unrestricted abortion rights, including the provision of government subsidies for those who cannot afford the procedure; illegal immigrants should be offered a path-to-citizenship; any restrictions on immigration are essentially racist efforts to prevent Hispanics and other nonwhites from entering the country; the expansion of the U.S. military would be a misguided use of resources that ought to be spent instead on social-welfare programs; affirmative action in employment and academia is a necessary means of compensating nonwhites for historical injustices that they and their ancestors suffered; school vouchers are unjustified because they siphon vital resources away from public education; the availability of firearms should be restricted by any means necessary; and high earners should pay dramatically higher income-tax rates than lower- and middle-class people. For an overview of Wilson’s voting record on a range of issues during her years in Congress, click here. For additional information on Wilson, click here. 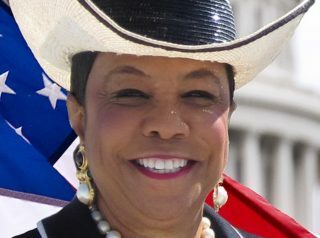 Further Reading for Frederica Wilson Profile: “Frederica Wilson” (Votesmart.org, Ballotpedia.org, Keywiki.org); Frederica Wilson’s Positions on Key Issues (OnTheIssues.org); “Racism: The Universal Explanation” (National Review, 8-23-2011); “Jesse Jackson, Democrats [Including Frederica Wilson]: Tea Party Racists, ‘Real Enemy’” (Newsmax.com, 8-23-2011); “Congresswoman: Some of My Constituents ‘Eat Dog Food When Their Food Stamps Run Out’” (CNS News, 7-15-2013); “Much of Congressional Black Caucus Ignoring Benjamin Netanyahu’s Speech” (Breitbart.com, 2-12-2015); “Lawmaker: Ban ‘Illegal Aliens’ – Just the Words” (WorldNet Daily, 2-28-2007). Further Reading for Section on Wilson’s Reaction to President Trump’s Remarks: “Congresswoman Says Trump Made Insensitive Comment to Service Member’s Widow” (ABC News video, 10-17-2017); “Florida Democrat Calls Niger Ambush ‘Trump’s Benghazi’” (Politico.com, 10-19-2017); “Full Transcript and Video: Kelly Defends Trump’s Handling of Soldier’s Death and Call to Widow” (NY Times, 10-19-2017); “Dem Rep Frederica Wilson: WH Chief of Staff Kelly’s ‘Empty Barrel’ Label a ‘Racist Term’” (Breitbart.com, 10-20-2017); “Rep. Frederica Wilson Breaks Silence AGAIN, Accuses White House of ‘White Supremacy’” (Daily Wire, 10-22-2017). “How Matthew Shepard Prefigured Trayvon Martin” (American Thinker, 10-8-2013); “Trump’s Latest Accuser Has History of Lying” (Newsmax.com, 10-18-2017); “Dem Congresswoman: Arrest Zimmerman ‘For His Own Safety’” (Breitbart.com, 3-28-2012); “Black Caucus To Push Racial Profiling Legislation” (National Review, 7-17-2013).